When Julie Nováková first told me about her anthology, I was thrilled because I hadn’t yet come across any Czech speculative fiction in English translation and I was eager to learn more about it. Let me tell you, this collection does not disappoint. Like any successful anthology, it features a diverse array of stories, featuring everything from space travel to dragons, alien viruses to worm holes that are actually worms, and much more. 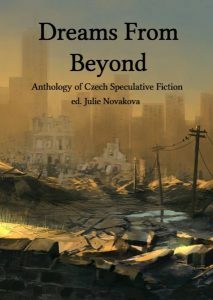 Dreams From Beyond also includes a great introduction of each of the writers featured, plus a piece that Julie previously published in Clarkesworld– “Small Markets, Big Wonders”- about the Czech sf market. And where, you might ask, could you get your paws on this awesome-sounding anthology. Well, RIGHT HERE! Unlike “War Games,” “Creators” involves little action but a lot of conversation between a theoretical physicist and an astrobiologist about the nature of some strange wormholes that humans have begun using for space travel. As they wait for the ship that they’re on to enter a wormhole (so they can study it from the inside), the scientists talk about the collision between religion and science in this case; in other words, were the wormholes built by “Creators” to help humans explore the universe? or are they just random, natural phenomena? Torgensen, the physicist, complains that his refusal to simply accept the wormholes’ existence without finding out their cause has led some to label him a “quantum mystic,” implying that he believes in some sort of powerful beings rather than the laws of physics. “Creators” brings up age-old questions about the nature of the universe and how we study it, and its conclusion is both brilliant and terrifying. Finally, “The Symphony of Ice and Dust,” which I read first in the Apex Book of World SF 4, is a lyrical story about time, creativity, and exploration. As in “War Games,” Nováková moves us back and forth between perspectives, introducing us to characters who live in wildly different times but who all experience the (often fatal) draw of the dwarf planet Sedna. When a group of advanced humans finds the crashed ship and bodies of earlier astronauts, they work to make a grand symphony out of the data logs and sensory data gathered from the planet. The early astronauts, in turn, had discovered an alien ship that had crashed into the planet millennia before that, but were unable to transmit their findings to Earth because of an accident with their own ship. What began as a mission of discovery ends in a memorial symphony for two brave astronauts who gave their lives to exploration. I urge you to read all of these stories and learn more about these talented writers. Thanks again to Julie for sharing this collection with us!